Do you ever wish you could go back to the good old days? The days when hair was curled, skirts were long and everyone believed that soft drinks were great for your health? If you want to inject a bit of that swell fifties style into your home, you’ll love Retro Kitchen’s real gone range of kitchenware! Functional, fashionable and, above all, hip, you’ll be happy to leave these handy canisters on display where you can access them quickly and easily. 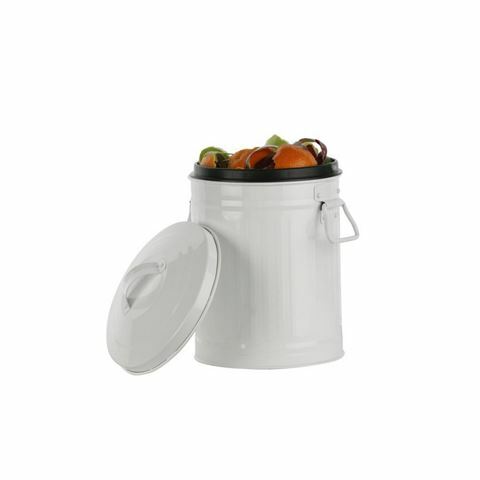 So dress your kitchen up with this cool scrap bin from Retro Kitchen. Combining 1950s style with today’s eco-friendly outlook, this scrap bin allows you to set aside and store any kitchen scraps which are suitable for your compost heap. Neat! Made from metal with a durable enamel coating. Matching lid keeps your scraps out of sight until you’re ready to dispose of them. Handles on each side for easy lifting. Includes a sturdy plastic bin with handle, which fits inside the metal container and lifts out for easy scrap disposal.